Jeremy began his musical career in Canterbury Cathedral where he was Senior Chorister, and later studied music at Liverpool University. He spent five years as Music Editor at the Royal National Institute of Blind People, where he was responsible for the transcription of print music into Braille. In 1986 he joined EMI Records as a Literary Editor and from April 1990 combined his work as a Consultant Editor for EMI Classics and later Boosey & Hawkes Music Publishers with his career as a freelance conductor. From 1998 to December 2004 he was Conductor of the Wooburn Singers. He has also worked with the BBC Club Choir, Kent Youth Choir, Brighton Festival Chorus, London Choral Society, Trinity College of Music Chamber Choir, Philharmonia Chorus and the BBC Singers in a series of programmes for BBC Radio 3. 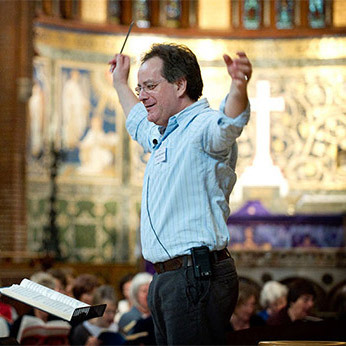 He has been the sole Music Director of the award-winning chamber choir Vasari Singers since 1981 and is also Conductor of the 150-voice Guildford Philharmonic Choir, now Vivace Chorus. Jeremy is totally committed to contemporary music and to the commissioning of new works. He and Vasari have commissioned over 20 new works in their recent history, from small anthems, to works of the grandest scale. Jeremy and the Vasari Singers have broadcast frequently on BBC Radios 3 and 4, and have a discography of nineteen CDs on the EMI Eminence, Guild and Signum labels. In January 2009 Jeremy took up the post of Music Director of the Salisbury Community Choir, a 150-strong non-auditioned choir. His first major engagement with them was the opening concert of the Salisbury International Arts Festival, in Salisbury Cathedral on Saturday 23 May, premiering a vast new work by Bob Chilcott called the Salisbury Vespers. In 2014 he most recently conducted the choir in their 21st Anniversary Concert in Salisbury Cathedral performing the “City Garden” a work commissioned from the composer Will Todd. Please visit www.jeremybackhouse.com for further information.